Every week, Joy hosts the Readers’ Workouts at Joy’s Book Blog. Usually I just leave a comment with how I’ve doing with exercising or eating or whatever, but if I want to finish a 10-mile trail challenge in November, I need to actually get serious. I’m starting at Week 1. I’m already a little off track, but not bad. Yesterday I ran 3 miles, a mile over the target, but skipped the strength train/stretch. I did take the dog for a mile walk, though, so maybe it’s a trade off? 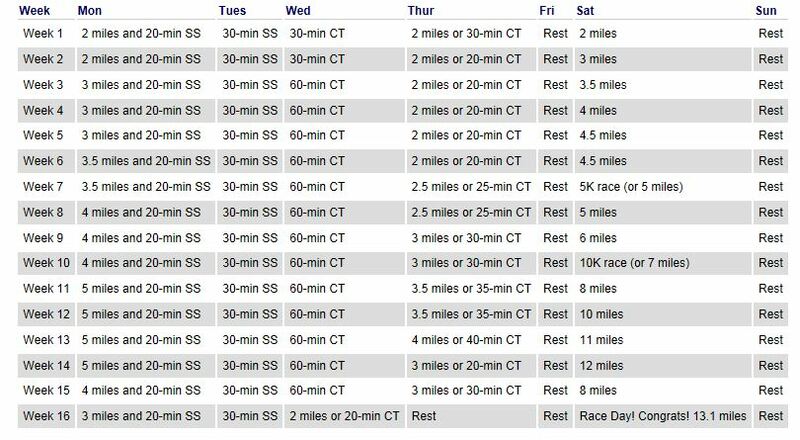 This plan is for a 13.1 miles and I’m not going that far, but a trail run is a bit tougher, I think, than a street one. Here’s my run from yesterday evening. Yes, I’m slow, but I’m okay with that. It was hot and muggy, but I did pretty well. Today is 30-min Strength Train and Stretch. I think I’ll try to head out to the gym for a bit, but David wants to get in the pool, so we’ll see. Maybe I’ll do my yoga DVD – I haven’t done that for a while. Next week, hopefully, I’ll report on how I’m doing. I’m also going to sign up for a 5K on August 2. If you feel like joining in on the Readers’ Workouts, head over to Joy’s Book Blog. Looks like a great plan! And you’re off to a good start.